September | 2016 | Grandma Runs! We’ve all heard about St. Jude Children’s Hospital in Memphis, Tennessee, but have you really taken the time to learn about their mission and about all of the great things they do? If I didn’t have a personal connection, I can’t say that I would have taken the time to learn. Oh, I’d have been brought to tears by their commercials, and donated a dollar here and there when I was shopping, but if it weren’t for my great friend, Katie Weyer, I would not have had the opportunity to really know St. Jude, and to meet not only families impacted by the hospital, but also incredible doctors, nurses, and other staff whose mission is to save kids. The following is Katie’s story, the reason we run for St. Jude. The doctors and nurses at Jude – Simply amazing people. I text/call/email them constantly and they still put up with me. They are the reason I am here today, and I can’t even put into words how important they are to me. Even through non-cancer issues, they are my people. I am fairly certain that not many people get wedding gifts from their oncologists, or messages from their radiation oncologists on their birthdays, or countless texts and phone calls from their nurse practitioners. I first knew something was wrong my senior year at Belmont University where I was a cross country runner. I went from being able to run 13-14 miles without a problem to not being able to run five minutes without feeling as though I was suffocating. I had two knee surgeries that year, so I don’t think the problem presented itself as obvious at the time. Looking back on it, it was my chest, not my knees, that kept me from running. I was going to the doctor at Vanderbilt at least once, if not twice, a week; and I was seeing the Vandy doc in the training room ever single time he was there. He even uttered the words to me, “it is nothing serious – not like lymphoma or leukemia or anything.” Needless to say, that doctor from Vanderbilt called me after my diagnosis to apologize and tell me he totally misinterpreted my symptoms. I had my second knee surgery in May of 2005 at Vanderbilt, but they never did a chest x-ray as a pre-op test because I was a healthy college athlete. Looking back, my heart rate was about 140 on the morning of my surgery; they told me it was just nerves. I know now it was a cancer symptom. St. Jude said I was lucky I came out of regular anesthesia, and honestly I remember sleeping for three days straight after the knee surgery – another sign from my body. I was doing my first round of student teaching that semester, and I had a fever over 100 degrees every single day. Every. Single. Day. I was in bed for two weeks over Easter. Every day that I went to student teaching was a day I lied to my professors about what my fever really was. Looking back, my body gave me so many signs: I lost 25 pounds; my hair was falling out; and I really looked like death. I went on vacation to Fort Walton with Brian and Mary Jane Beckort early that June. I remember feeling so terrible during that week, and all I wanted to do was sleep. We got home the weekend of the Glen Ress Golf Tournament, and I woke up that Saturday with a HUGE lump in my neck. HUGE. My mom was out of town at a wedding in Indianapolis, so I showed it to Dr. Ress in passing at the golf tournament. He told me then to come in Monday. The rest is history. Dr. Ress figured out just by looking at me and talking to me that I had cancer. He said it was either lymphoma or leukemia. We followed up with some doctors here at Perry County Memorial Hospital, and then at St. Mary’s in Evansville. When I told my friend Kristin about the diagnosis, her dad – a doctor at St. Jude – called my dad and said get to St. Jude in Memphis. He said he had a friend, Melissa, who could save my life. This was on a Friday I believe. We loaded up (Mom, Dad, and me) in my Aunt Julie’s van and went to Memphis. We arrived at St. Jude on a Sunday afternoon. My college teammates and great friends Kristin and Lindsay (both from Memphis) met us at the hospital. Did I mention a person has to be 21 or younger to be admitted to St. Jude? I was turning 22 that coming Thursday. Monday, June 20, I began a gamut of tests at St. Jude, which ultimately gave me a diagnosis of Stage IIB Hodgkin’s Lymphoma. I signed all of the consent papers on Wednesday, June 22, the night before my 22nd birthday. I can remember sitting in the consult room and they read all kinds of things to me. After the first two sentences, I didn’t hear anything else. “You’re daughter, Katie, has Stage IIB Hodgkin’s Lymphoma. Left untreated, this is fatal.” It didn’t matter to me, or my mom and dad what they said after that because we were doing whatever it took to beat this cancer. My doctor, Melissa Hudson, lined out everything. I had 12 weeks of chemo (that I could do in Evansville with the help of Dr. Tony Stephens), and then 3.5 weeks of radiation that had to be done in Memphis. They let me have the day off of my birthday, so I started chemo on my first full day of being 22, June 24. Thinking back on it, so many fun things come to mind to do on your first day of being 22, and chemo is definitely not one that comes to mind. That Friday night we went to dinner with Kristin and her parents, and another doctor from St. Jude. I really didn’t feel any different. The next day, Kristin’s dad took my dad golfing and I seriously hibernated for the next 72 hours. My mom said it was like I was a baby again, just sleeping all day, waking to go to the bathroom and that was it. On top of all of this, my twin sister Kelly was getting married on July 2 and St. Jude couldn’t promise I would be able to be there. Can you imagine missing your sister’s wedding? I was able to go to the wedding and all went well. My 12 weeks of chemo and 3.5 weeks of radiation went as well as can be expected. I student taught with Mary Jane on the days I wasn’t getting chemo, and then moved to Memphis for radiation. I finished treatment up in late October 2005. Fast forward to September 2006. I had just been hired for my first teaching job at Tell City Junior High School, was helping with cross country, and just bought my first car. I went to the North Harrison cross country race on a Thursday night and left from there to head to Memphis. We arrived in Memphis at 1am, and had a PET scan the next morning. It was then we received the news that something had popped up. We came home for Labor Day Weekend, and went back to Jude on Tuesday to confirm relapse. I honestly don’t remember a lot of this because I was numb and furious. Two weeks into school year and wham-o – I’m back in the cancer world. The good news was they had been following up with me every 3 months, so it hadn’t had that long to grow. However, they had suspected something in July, but couldn’t get it to come positive on a needle biopsy that summer. I should’ve known it was going to come back, but it really just shocked me. The treatment plan this time was “salvage therapy” and “off protocol” meaning that they weren’t interested in putting me on a clinical trial, but rather just saving my life. Three intensive inpatient treatments (hadn’t ever been inpatient up until now) consisting of four to five days of being in a hospital bed because the chemo was so harsh. Three weeks in between, and then autologous (from my own cells, because they were cancer free) stem cell transplant. This stretch of the fall was terrible. I got so sick from the chemo. The thing that pulled me through it was cross country and getting to come home for some of the meets. Getting to make an impact with the girls gave me a purpose. Worst day of this treatment cycle: The week of cross country semi-state, my mom and I were making plans to come home so I could go to Semi-state in Bloomington with the team. We had a very good chance to win the whole thing, which is a huge accomplishment for an unclassed sport in Indiana. There were only 4 semi-states in the whole state; I had to be there. We called my doc (Hudson) on her cell and she said to swing by clinic, get my labs drawn just for safe measure, and then hit the road. We packed, went to clinic for the draw and waited. When they called me back to A clinic, I was ecstatic to be leaving. My happiness didn’t last long. They told me that I had a platelet count of zero and that traveling was out of the question. I broke down right there in clinic. I was simply devastated. After that I remember talking to Coach Beckort on the phone and just being devastated about not being able to come. He said “you’ll be here” and I told him he was nuts. Long story short, Claire Tuggle’s dad, Bob Tuggle had Zac Hartz make a life-size cut-out of me so that I could, in fact, be there for semi-state. The girls carried that cut out around at the meet, and that meet was one for the history books. I did get to go to the state meet, and how fun that was. After the three hellacious chemo rounds inpatient, it was time to begin preparing for the transplant. I was lucky because I could get my own cells, but also that I had an identical twin sister, Kelly, who could also give me cells. They took my stem cells out between my 2nd and 3rd chemo rounds and froze them. I had to sit still in a chair for nearly six hours hooked up through my central line and an IV to syphon out all the cells. They then seriously tested EVERY SINGLE thing in my body to get baselines for transplant. We went home for Thanksgiving, and then Jeanie DeSpain drove us down to Memphis the Sunday after Thanksgiving so I could go to inpatient on the fourth floor, the bone marrow transplant floor. I wouldn’t leave that room for over three weeks. I got some very toxic chemo for transplant. The goal was to wipe my blood of all blood cells – red cells, white cells, platelets, neutrophils, etc. When they would run my labs, they would read 0’s across the board. They count everything in transplant around your actual transplant day. For me, this day was December 4, 2006. So the days leading up were known as Day -3 , -2, -1, etc. with December 4 being Day Zero. Then day +1, +2, etc. I don’t remember much of this time, as I spent most time sleeping or puking. The goal every day was just to take a bath and change pajamas. it is really hard to describe it really. My mom and I were together in a very small space for almost four weeks. Physical Therapy would come and beg me to just stand up. I – a collegiate athlete – then considered the simple act of standing hard work. I got out of the transplant unit about a week before Christmas, but we had to stay very close to the hospital. We had to come to the hospital every day for blood counts and other various tests. We didn’t know if we would be home for Christmas or not. We got home December 23 about 8 pm. I had to be back at Jude just a few days after Christmas to start radiation. 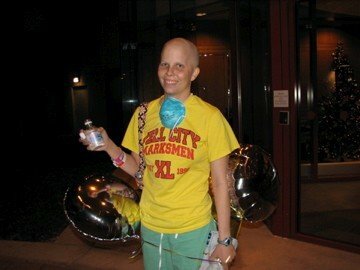 I finally finished radiation in late January 2007 and have been cancer free ever since! Throughout this whole experience, there were also many positives, such as the friends I met. The world of cancer is one that I don’t wish on anyone, but unfortunately everyone is confronted with it at some point. The world of pediatric cancer is something even more indescribable. I was lucky enough to make friends with several other patients and their families. I met a girl, a lot like me my very first week at St. Jude – Kristen Whitlow. She is six years younger than I, but we were diagnosed with the exact same thing and went through treatment together. She relapsed three months before I did, meaning that we can still compare battle scars to this day. She is the one person in the world that understands my cancer experience at the very core. She lived it too – and still lives with it just like I do. If I am having a problem or worried, she is my first contact. I met two boys during transplant: Westin Dietz and Jay Rogers. Westin had neuroblastoma and Jay had Ewing’s Sarcoma. My mom networked with their moms, and Westin’s little sister Emma spent a lot of time in my room. She helped make me smile every single day no matter what. Unfortunately, both of these brave guys aren’t around anymore. Not a day goes by that I don’t think of them. It’s hard to wonder why I am here and they aren’t. That’s tough. I got to see Jay not long before he passed when I was in Memphis for a checkup. We were able to snap a picture together before he got called back by imaging for his appointment. Jay was a fifth or sixth grader during transplant. Westin was 22 months old. A baby. I have countless other Jude friends. Kevin had AML and was a patient at Tulane in New Orleans when Hurricane Katrina hit. He, along with countless others, relocated to St. Jude when their medical records were destroyed by the hurricane. He just celebrated ten years post transplant. His wife, Hannah, is a Hodgkin’s survivor, who was treated at St. Jude. My good pal Tommy was four at diagnosis and had non-hodgkin’s lymphoma. I keep up with him and his family via facebook. My friend, Thad, who was closer to my age at diagnosis, had Hodgkin’s, but luckily he never relapsed. The same is true for Caroline from Louisiana. There are countless others as well. Kelly was down visiting once and Tommy went running to her arms as he thought she was me. That goes to show you that kids don’t see a person by how much hair they have on their head. I was bald as can be, and Kelly had a full head of hair. Not even noticing, he jumped into her arms. My mom. My mom was there with me through the entire process. She took care of me without complaining on my good days, and more importantly on my bad days. She remembers way more of the story than I do, as I slept through a lot of the terrible times. My sister Kelly dealt with the brunt of the storm here at home. She answered the question after question from everyone she saw. All the while, one can only imagine the questions and fear that she had as her twin faced this deadly disease. The Furmans opened their house and hearts to us from the first minute we stepped in Memphis. I called Jane once from being inpatient and told her I needed a pound of shaved ham from the Kroger deli. She delivered about 30 minutes later, and I am fairly certain I ate the entire thing. All of my extended family and friends went into protective and helpful mode. It was awesome. I could rattle off 1000 more stories. I’ve compared it to college, with mom as my roommate and a terrible class load. The bottom line is that I wouldn’t change my cancer experience for anything. Yes, it was terrible and horrible at times, but it has shaped me to be who I am today. Do I wish I could run 13.1 miles without walking? Sure. Do I wish I didn’t have to go to the doctor more than my peers? Sure. Do I like myself better after cancer? Absolutely. I have a greater appreciation for what is important and I feel like I have a good sense of how to live life to the fullest. Fortunately, Katie’s story goes on. She is a seventh grade science teacher, cross country and track coach, wife, and most importantly, the mother of Jack. She was given her life, and she uses that gift to make a difference in students’ lives every single day. Because of St. Jude, she is able to mentor the youth of our community. St. Jude didn’t just make a difference in Katie’s life; it made a difference in the lives of her family, friends, and our students. There are so many reasons runners sign up for races. We want to see what we can do, improve our times, run with friends, earn a cool medal, and the list goes on. This race is different. As we were running the Memphis streets last year, we commented that there was no way we could not run again this year. Running down those streets hearing kids and parents thank us for raising money that would help in their fight was so humbling. Running through the St. Jude Campus was perhaps the hardest and best part of the run. Young patients who were able to be outside cheered us on as we trotted by; it should have been us cheering them on as they were deep into the hardest fight of all. Over the next three months, our team will be asking – and sometimes begging – for your donations. We have seen first-hand what your money does. We have our friend because people just like you gave. Cancer knows no boundaries, and can strike any of our children, grandchildren, nieces, or nephews. Let’s help St. Jude families so that as they are fighting this disease, they don’t have to worry about their finances. Here’s the link to my fundraising page. After you make your donation, please consider sharing this link with your friends!